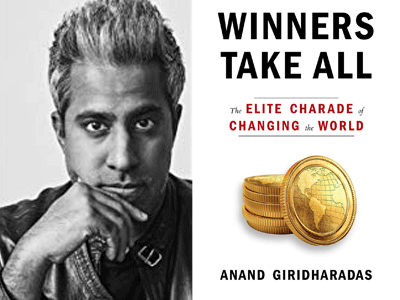 Anand Giridharadas is the author of Winners Take All: The Elite Charade of Changing the World, which explores the ways in which the global elite’s efforts to “change the world” through philanthropy preserve the status quo and obscure their own role in causing the problems they later seek to solve. His past books include India Calling: An Intimate Portrait of a Nation’s Remaking and The True American: Murder and Mercy in Texas, which has been adapted into a film, to be released in 2019. He is also an on-air political analyst for NBC News and MSNBC, as well as a visiting scholar at the Arthur L. Carter Journalism Institute at New York University. He is a former columnist and correspondent for The New York Times, as well as for The Atlantic, The New Republic, and The New Yorker.